Are you one of the many people who are over the age of 60 who are wondering if they still have what it takes to date again? Is this the reason why you are at this Singles Over 60 review? Then you will surely get some information from this Singles Over 60 review below. A lot of senior singles no longer need to do the usual dating process, wherein you need to come up and talk to someone. Some people don’t have the courage to do this, which is why the internet is one of the greatest gift to humanity. With the many dating sites today, almost everyone can find a date almost instantly. One of the many niches of online dating sites is senior dating sites, like Singles Over 60. As the name says, this kind of dating site caters to people who are over the age of 60. Before you get all excited, it would be best to read this Singles Over 60 review first. Singles Over 60 is an online dating site that specifically help people who are over 60 to get to know each other. The members are from all over the world and majority of them are looking for that perfect match that they can be with for a lifetime. This online dating site has hundreds of thousands of single members who are looking for people like you. Members on Singles Over 60 have the option to look for a match around the nearest city or they can also look overseas if they prefer that. But if you are in the US then worry no more because majority of the members on Singles Over 60 are from the US. Also, their tools and services are very easy to use, but they still offer support if their members get stuck or are having problems. As someone who is over the age of 60, it can be daunting to navigate a complicated website. But with Singles Over 60, everything is definitely easy to use. 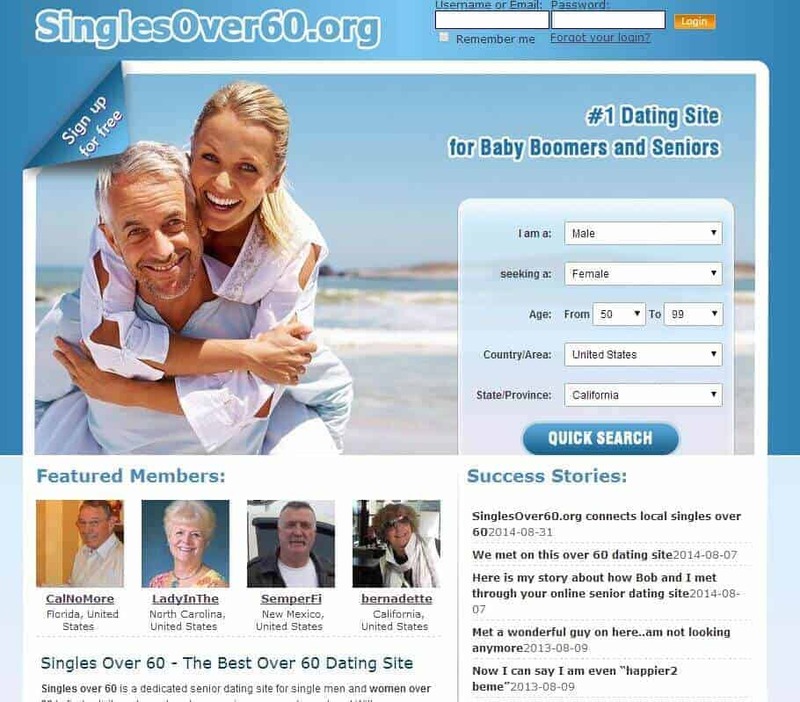 The reason behind this is because the site made sure that this dating site will be easy for seniors. There is also an online support which will assist members if they need help. Lastly, there is a video tutorials to help you get by. The first thing that you need to do is to sign up which you can freely do. You will be asked to key in your name, email address, age, and password to secure your account. Once done, you can start uploading a profile photo of yourself. It would always be best to upload something that is recent, instead of posting something that is from years ago. Once you are done with signing up and creating your profile, the next thing that you need to do is to start finding single people around your area. You can use the search tool that the site has where you can search for members using your preferred postal code. Once you have found a member that you like, then you can start sending a wink if you are too shy. You can also send an email if you feel like it. Everything on Singles Over 60 is simple and clear. The reason behind this is because the site knows that its members are looking for nothing but their perfect match who are in the same area as they are. One of the best features of Singles Over 60 is that you can clearly see who is online, which can help members know who to chat. Once you see who is online, you can immediately send them a message and get to know each other. Another good thing about Singles Over 60 is that the members can create or watch videos that are packed with detailed information about your character and life. This feature will help other members to understand what and who you are looking for. Of course, to ensure that every member will get the support that they need, Singles Over 60 made sure that there are enough customer service support for everyone. They will assist the members if they have questions about the site. Lastly, the site is confidential and secure so you don’t have to worry about anything at all. You can pay via money order by postal mail, bank check, PayPal, American Express, MasterCard, and Visa Credit Cards. These are all of the information that you need to know about Singles Over 60 review. With this Singles Over 60 review, you now know what to expect. You can enjoy the free membership for as long as you want but the features will definitely be limited. If you want to make use of all the features, then getting the paid membership will do. This will also increase your chances of finding a match.